Air Temple Arts is a 4200 square foot studio located on the Woodbridge/New Haven line. 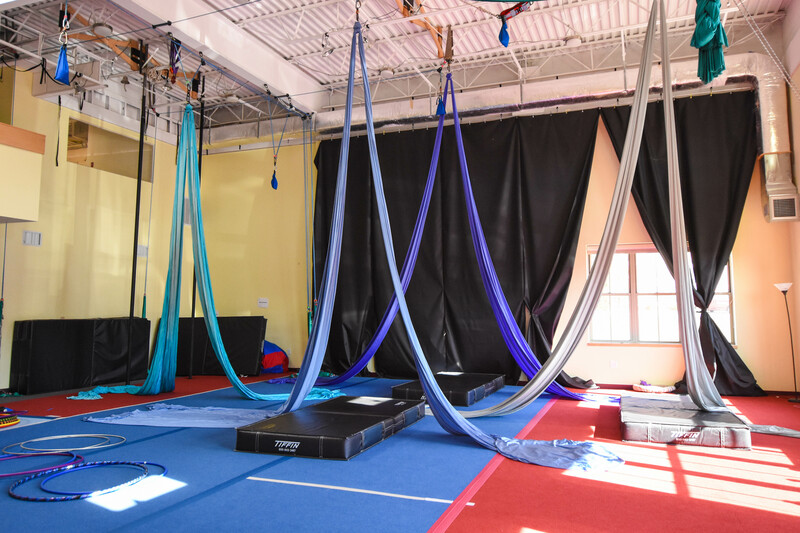 We offer a wide variety of aerial dance and circus classes for youth and adults as well as a spin/juggle jam, and many other training opportunities. Whether you have a driving interest to learn the circus arts, or want to add variety to your current workout, we have something for you! Circus classes offer a full body workout, focusing on gaining both strength and flexibility in equal measure. Circus classes also have the added benefit of helping you train towards specific skill-based goals as opposed to a number of reps.
Air Temple is Connecticut’s number one spot to learn circus arts. We follow only the safest industry practices, and our class sizes are small to maximize one on one time for students. All of our instructors have completed certification and training programs where applicable, and have over fifty years of circus teaching experience combined. We have 20′ ceilings, rigging points on moveable pulleys for easy adjustment, acro lines, a 3:1 pulley point, a yoga/hand balancing room, a study lounge, wi-fi, a kitchen and bathrooms, and AC. Read up on our Studio Policies before coming to class!